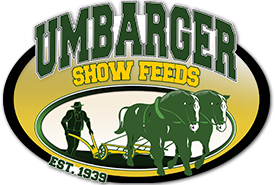 Primer Plus 13% has twice as much Amaferm as the other Umbarger Beef Show Feeds. Lasalocid has been increased to aid in the prevention of Coccidiosis. Primer Plus 13% is an excellent product to use when preparing your animals for a sale. There is enough corn in it to put the needed bloom on sale calves and enough fiber to expand a calf's stomach and retain that full look. It should be fed post-weaning to sale time at a rate of 2% of body weight per head per day. The calves should then be switched to Breeder Grower. Primer Plus 13% works great when mixing calves from different herds and when calves are at different stages. To be fed as a receiving agent to weaned calves along with hay of your choice. Free choice mineral and clean, fresh water should be made available at all times. WARNING: This product, which contains added copper, should not be fed to sheep or related species that have a low tolerance to copper. Safety of Lasalocid in unapproved species and breeding animals has not been approved. Eimeria parva and Eimeria intricata in sheep maintained in confinement. Steam flaked corn, steam flaked oats, steam flaked barley, cottonseed hulls, linseed meal, soybean meal, canola meal, wheat middlings, sunflower meal, salt, calcium carbonate, sodium betonite, monocalcium phosphate, dicalcium phosphate, dried Aspergillus Oryzae fermentation extract, molasses products, ferrous sulfate, zinc sulfate, calcium iodate, cobalt carbonate, zinc oxide, managenous oxide, copper sulfate, ethylenediamine dihydriodide, sodium selenite, magnesium oxide, vitamin A acetate, vitamin D supplement, vitamin E supplement, menadione dimethylpyrimidinol bisulfite (source of vitamin K activity), thiamine mononitrate, riboflavin supplement, calcium pantothenate, niacin, vitamin B12 supplement, choline chloride, proprionic acid, water, ammonium hydroxide, sorbic acid, benzoic acid, phosphoric acid, prophylparaben, methylparaben and BHA.